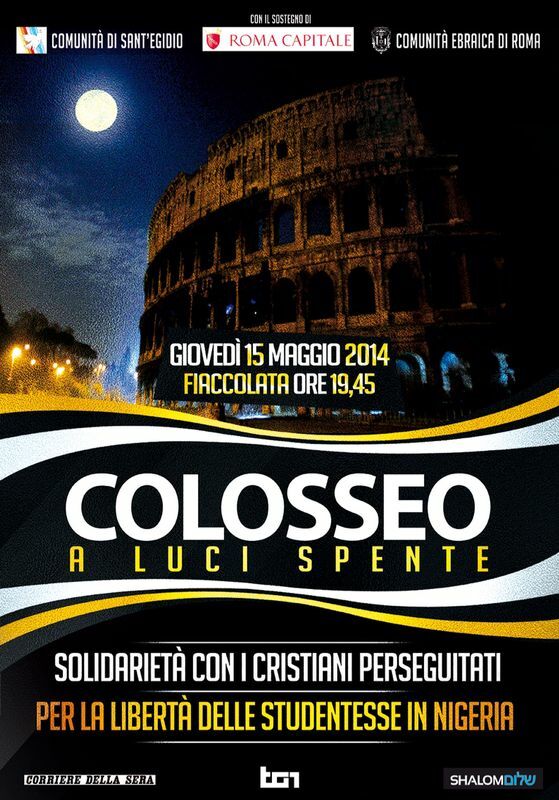 On Thursday May 15th a candlelight vigil organized by the Community of Sant'Egidio and the Jewish community of Rome will show the support of the Italian capital city to all those who are discriminated or persecuted because of their faith in Africa, in the Middle East, in Asia. solidarity with Christians who are risking their lives in practicing their own religion. In that same moment torches and candles will be raised in memory of the victims. The whole city has been invited to participate in order to say ‘No’ to all forms of fanaticism and extremism, to put a stop to any kind of persecution and remember the souls of those who have been the victims of anti-Christian hatred. The persecuted Christians are not alone. From Africa to the Middle East, to Asia appeals for peaceful coexistence are contradicted by incidents where violence erupts. The recent kidnapping in Nigeria of a large number of schoolgirls by Boko Haram terrorists is another example of the horrible forms of violence and persecution that affect many corners of the world. The people around the Coliseum will add their voice to the many appeals for the liberation of those girls and their restoration to a normal condition of life. The persecution against Christians, too often overlooked or hidden by a veil of indifference, should prompt intervention solidarity of all men and women of good will, of every religious denomination. The condemnation of violence and religious hatred, real blasphemy of God's name, must be unanimous, the hands of persecutors must be stopped, the chain of crimes, the result of intolerance, must be broken.